Thousands of passengers are missing the chance to claim compensation for delayed flights, research has found. 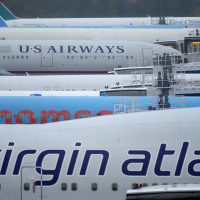 More than 900,000 people could be entitled to compensation after around 43 million passengers were delayed flying in and out of the UK in the last year, according to data from consumer charity Which?. A total of 449,000 flights were late by 15 minutes or more between April 2015 and March 2016 - almost a quarter of the 1.9 million total - figures show. Around 10,000 of those were at least three hours behind schedule. Passengers subjected to delays could be entitled to compensation if the disruption was not caused by "extraordinary circumstances", such as weather conditions or airport strikes. Compensation can include meals, refreshments, phone calls and overnight accommodation, and is dependent on how long the delay is and how far the flight travels. Long haul travellers could be entitled to £250 if their plane landed between three or four hours late, or £510 if their flight was at least four hours behind schedule. Passengers flying short haul are also potentially eligible to claim up to £210 if they were delayed by more than three hours. There were 183,000 long haul passengers and 729,000 short haul travellers who were delayed by at least three hours in 2015/16, according to Which?. Alex Neill, director of policy and campaigns for Which?, said: "Arriving at the airport to discover your flight has been delayed is incredibly frustrating, and something thousands of holidaymakers will encounter this summer.